If Apple are set on removing the minijack from their phones then some folks are going to be a bit miffed. I’m hoping it’s just because the minijack is really old (circa 1878) and not just because they want to make the phone thinner. Personally I’d be happier with a fatter phone containing a bigger battery. I have around eight mics that rely on a minijack connectors. That said, I imagine there will be some kind of expensive analogue to digital adapter that means they can still be used. The one mic I carry in my pocket on a daily basis though is the Shure MV88. It’s one of Shure’s Motiv range and comes with a case and a windshield. It was a shame to leave it’s protective case in a drawer but it was just a little bulky. Without it I can drop the mic and windshield into my pocket and I have a stereo recording solution wherever I go. Last year I raved about the Røde VideoMic me. It’s also a tiny mic but without it’s massive windshield it’s useless outdoors. 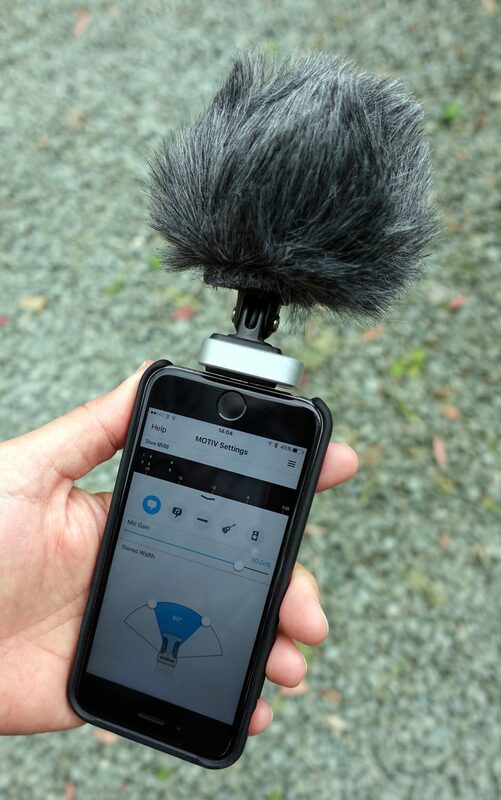 The MV88 has a much more compact solution for recording outdoors and the optional Rycote ‘dead cat/hamster’ for heavier wind is also flat and pocketable. 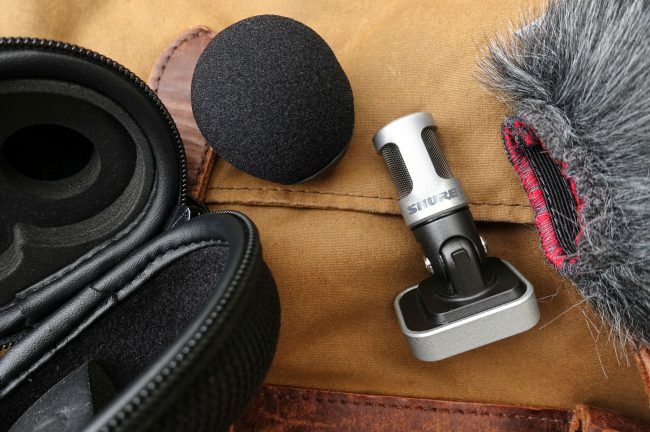 The Røde is a third of the price of the Shure MV88 but the Røde is altogether a simpler beast. For a start the MV88 is stereo. And lots of different flavours of stereo too. 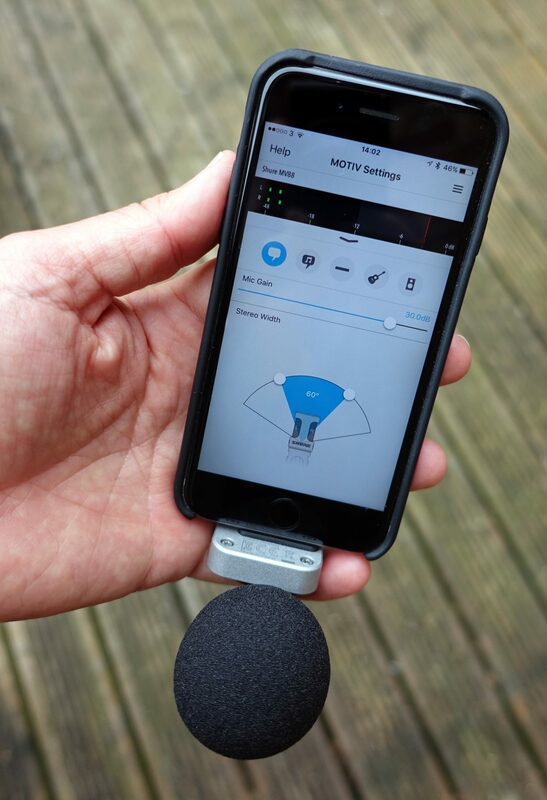 The microphone needs the accompanying Motiv app to use all the functions. It’s worth having an explore to see everything it can do. You can adjust stereo width, DSP modes, EQ, Compression and more. It also serves as a decent recorder and records in uncompressed .wav format. You can then convert recordings down to a more manageable AAC format for sharing to google drive/dropbox/email/text/airdrop etc. Shure have really thought this through. Unlike some other lightning connector mics you are not forced to record only to the proprietary app. All the processing is hardware based and lives on the microphone. The app just controls it. This means any changes you make to the gain, stereo width or EQ will stay on the microphone until you go back and change them. This also allows any app that supports external microphones (the built in camera app, FB live, Filmic Pro) to use the mic with those settings in place. I often dip into the app to check and adjust the levels and then use the mic with Anchor, Audioboom or simply to shoot video. Here is a quick audio sample recorded into the iOS app VRP7 and then shared on the audio conversation platform Anchor. At around £149 on Amazon, the only downside I can see to this mic is that it’s iOS only. There are some journalists using Android devices but I’m pretty sure they are not getting this kind of control over their external microphones. The mic is not built to compete with the pro options you may have on your Zoom H5 or H6. 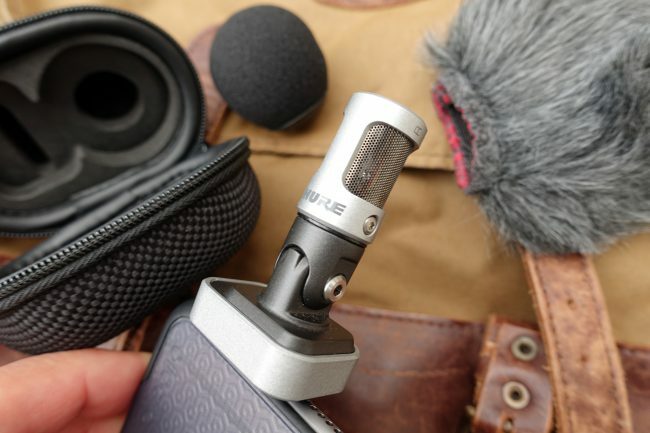 It’s designed to be portable, easy to use and give you optimum recording quality into an iOS device whenever you need it, wherever you may be. The audio bitrate captured is around six times better than what your standard iPhone mics are capable of. If you are a mobile journalist looking for an iOS mic for recording audio in close quarters then this mic will deliver. I must have around 20 microphones I can use for interviews, podcasting and film making. The Shure MV88 has quickly become my most used microphone. Do you have a preferred Line-in connector for the Lightning port on iOS? I’m trying to get recommendations for kit that might let me connect a field recorder into an iPhone. Did we sort this in the Anchor chat? Just had a quick read thru. I remember your review of the MV88. It’s a shame apple are dropping the jack but we knew the day would/could come! I know U like your apple phones, but how about an Android? I have an LG G5. Battery life is really great & swappable too. The Sammy Galaxy S7edge has an amazing battery life on one charge. But then maybe U need apple for editing/formats… Thought I’d make the suggestion. I have tried a lot of phones. The apps just don’t cut it on android. Too much like hard work not only to find them but to also get used to a multitude of UI’s. I just purchased this mic. It does not seem to hold the gain settings. To get the same volume as the built in I need to set the gain to 30db. I’m using it with hyperlapse as I find the video stabilization works really well. every time I go to shoot a video, I have to open the motiv app then hyperlapse and set the gain, otherwise it reverts back to 3.0 db. is this normal or am I missing a step with this mic? It might be worth pinging a question over to Shure on twitter. They are pretty good at sorting this kind of stuff out. It’s certainly not the experience i’m getting. Hi Terry, could it be an issue with that particular app? Have you tried it with filmic pro or the standard camera app? Mine never forgets the settings but I haven’t used it with hyper lapse. How well does it work as a direction mic? Up to what distance can it recorded? Thanks? Hi, It isolates the voice depending on the settings you program in the app. It’s many mics in one.